Click to learn How To Grow Cantaloupes. Cantaloupes are tender, summer vegetables that are culturally similar to cucumbers (and share susceptibility to the same diseases and pests). The most popular varieties have salmon-colored flesh and netted rinds. The names cantaloupe and muskmelon are both used interchangeably to describe the netted types of melons grown in the south. 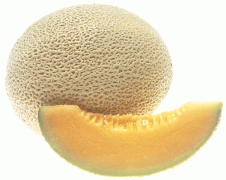 True cantaloupes have a hard, warty rind and green flesh and are not widely grown in the US. Muskmelons have been cultivated for several thousand years with the earliest record being an Egyptian illustration of funerary offerings from 2400 B.C. Muskmelons are believed to have originated in north Africa and Asia. They were also grown by Greeks by 300 B.C. They were grown in the New World as early as 1535 A.D. 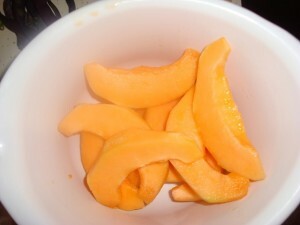 The cultural growing requirements of other melons like honeydews are similar to cantaloupes, but ripen later in the season and usually have smooth rinds. should cantaloupe plants be staked or grown on the ground? Cantaloupes should be planted on the ground and allowed to vine out. Sorry it took us so long to answer. We had a setting wrong that did not let me know you had posted a comment.